March 11, 2001 New York Times: "In the War on Gibberish, a New Investor Ally"
Investors often say they learn more from investment losers than from winners. That suggests that Valeant, the beleaguered pharmaceutical company whose market value has fallen by almost $60 billion since August, offers a bounty of teaching moments. 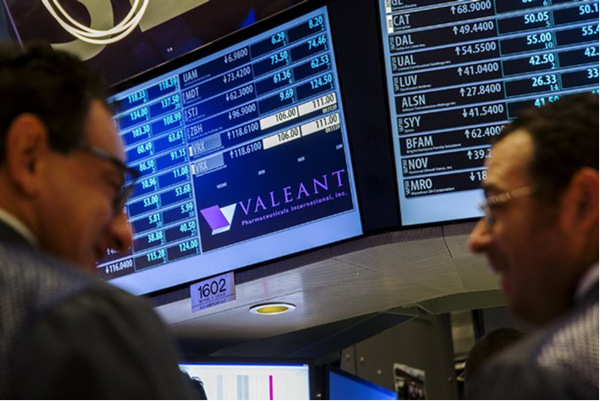 Valeant is among a growing number of companies that regularly present two types of financial results: those that adhere to generally accepted accounting principles, and those that help executives put the best spin on their operations. In accounting parlance, such adjusted figures — which exclude certain costs from calculations of a company’s earnings — are known as pro forma or non-GAAP numbers. But let’s call them what they really are: a false construct. Part of the problem with these adjustments lies in the freedom companies have to choose which costs they want to strip out. One company may exclude stock compensation costs from its earnings calculations while another in the same industry does not. That makes it difficult to compare the two companies’ operations. The tide of companies making up their own earnings calculations is rising, said Jack Ciesielski, publisher of The Analyst’s Accounting Observer. In a recent report, he noted that 334 companies in the Standard & Poor’s 500-stock index reported non-GAAP earnings last year, up from 232 such companies in 2009. The dollar amount of cost adjustments made to those companies’ profits totaled $132 billion last year, more than double the amount in 2009. This creativity is common practice in the pharmaceutical industry, so Valeant is certainly not atypical. But the difference between the company’s real earnings and its adjusted numbers is far greater than it is for its large competitors, making Valeant a prime example of this problem. In news releases, Valeant executives are careful to include their results under accounting rules. But these communications tend to focus more on the company’s primary hand-tailored figure — what it calls “cash E.P.S.” When providing forecasts, for example, the company supplies only pro forma numbers. Valeant strips out a laundry list of expenses from its revenue, including those related to stock-based compensation, legal settlements and costs associated with restructuring and acquisitions. Most significant, perhaps, for Valeant are costs related to acquisitions. Generally accepted accounting principles require companies to recognize over time the diminishing value of intangible assets they acquire when buying another company — or amortization. Valeant excludes those costs. At Valeant, an acquisitive company, this is a big number. This year alone, Valeant has paid $15 billion for six deals in which terms were disclosed. Excluding acquisition-related costs from its pro forma figures, including amortization, makes the company look far more profitable than it is. The company says it publishes pro forma figures to provide investors with “a meaningful, consistent comparison of the company’s core operating results and trends for the periods presented.” Valeant goes into detail on the expenses it is excluding, so diligent investors can do their own analyses. A spokeswoman for the company declined to comment further. Valeant took another blow on Thursday when the nation’s three largest drug benefit managers said they would stop doing business with a pharmacy that sold Valeant products. The hedge fund manager William A. Ackman, who is one of Valeant’s biggest stockholders, defended the company in a marathon three-hour conference call on Friday, yet its stock continued to plummet. Looking at Valeant’s real earnings compared with its make-believe ones exposes an enormous gulf. Under generally accepted accounting principles, the company earned $912.2 million in 2014. But Valeant’s preferred calculation showed “cash” earnings of $2.85 billion last year. That gap is far wider than at other pharmaceutical companies presenting adjusted figures. It’s easier to justify paying up for a stock when you’re relying on ersatz results. Valeant’s shares, at their peak of $262, were trading at 98 times 2014 earnings. Set against the fantasy figures, though, the stock carried a multiple of just 31 times. Not a bargain, perhaps, but also not insane. Given that the Securities and Exchange Commission requires companies reporting pro forma figures to publish GAAP numbers in tandem, you might assume investors would stay focused on the facts. But academic research appears to show that adjusted numbers drive stock prices. Consider a 2002 study on non-GAAP numbers by Mark T. Bradshaw, an associate professor of accounting at Boston College, and Richard G. Sloan, a professor of accounting at the University of California, Berkeley. The fantasy numbers had “displaced GAAP earnings as a primary determinant of stock prices,” its authors wrote. In an interview, Mr. Sloan said he was concerned about the proliferation of companies reporting non-GAAP figures and the challenges that posed to investors. Helping perpetuate these kinds of earnings myths, Mr. Sloan said, are Wall Street analysts who use companies’ invented figures in reports and stock price forecasts. “You’d hope that Wall Street analysts would recognize you can’t really value a company like Valeant whose business model is to pay cash to make acquisitions by ignoring the amount of cash it is using in those acquisitions,” Mr. Sloan said. Recent Wall Street research on Valeant highlights this problem. In an Oct. 1 report from Morgan Stanley, Valeant’s pro forma earnings are identified as “E.P.S.,” leading many readers to assume a GAAP number. A figure identified in a table as net income is actually Valeant’s adjusted number, which is far larger than the GAAP version. At Merrill Lynch, the Valeant analyst does a better job, presenting both GAAP and pro forma figures so investors can see the vast differences between the two. Analysts may feel compelled to use a company’s adjusted numbers when they reflect standard industry practice. At the same time, however, going along with a numbers game may also be a way to stay on good terms with a company’s executives. Analysts who exert independence can find that managers may refuse to answer their questions or otherwise turn off the crucial information spigot. Back in 2003, after pro forma earnings had begun to gain traction, the S.E.C. wrote a new rule to try to help investors. Known as Regulation G, it requires companies using fantasy figures in regulatory filings to present “with equal or greater prominence,” comparable financial measures calculated under GAAP. The regulation does not cover news releases. A version of this article appears in print on November 1, 2015, on page BU1 of the New York edition with the headline: Valeant’s Fantastic(al) Numbers.